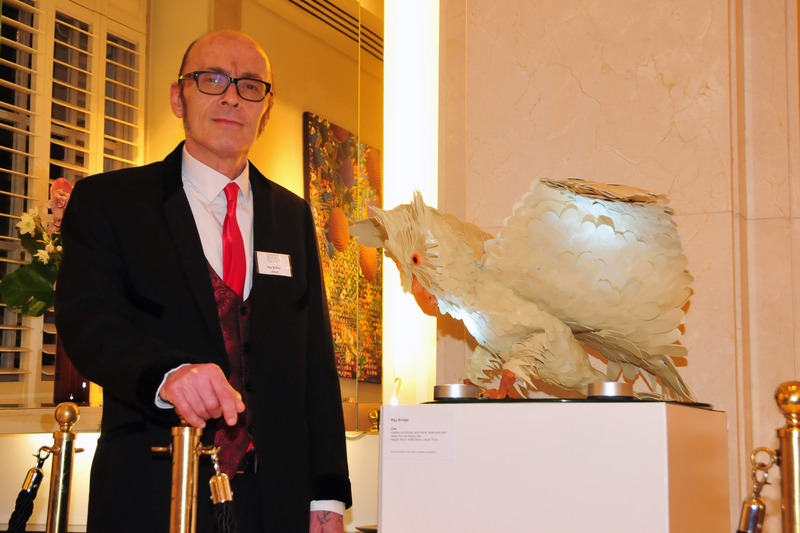 The eighth featured artist for OPEN, the community art event coordinated with Team London Bridge and taking place at London Bridge Hotel is Ray Bridge. This arts programme looks to promote those talented artists living or working in Southwark, where our hotel is sited. Over 100 artists submitted work for consideration with 14 being asked to participate in this first phase of the London Bridge Hotel OPEN which gives potential buyers the opportunity to see an artwork in an environment more akin to a contemporary home. All OPEN art works can be purchased and the exhibition runs until June 2019. Ray’s sculpture, Owl, tries to capture the moment the bird is about to take off, made from wire frame and covered in material recycled from a sofa. claws from air drying clay. Ray is from Bermondsey where he attended local schools and gained a CSE in art and design. Since redundancy in 2017 he has been concentrating on his love of painting and sculpture using a wide range of materials, inﬂuenced by British sub-culture and the natural world.